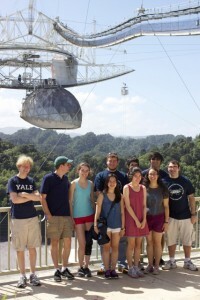 Last semester, the students in “ASTR 255: Astrophysics Research Methods” embarked on an four-day trip to the Arecibo Observatory in Puerto Rico. Led by Marla Geha, Associate Professor of Astronomy and Physics, their visit marked the first time an undergraduate group observed on the site in the context of a class. In three-hour blocks, each student directed the telescope at selected targets and took data home for further analysis. 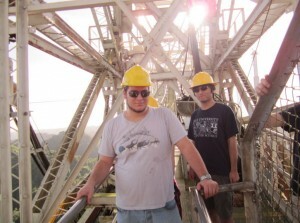 Students on a catwalk atop the Arecibo Observatory’s collecting dish. Image courtesy of the Yale Astronomy Department. As an introduction to the Astrophysics major, ASTR 255 aims to equip students with the analytical tools necessary for professional astronomical research. It is a highly intensive course that encompasses diverse topics from high-level programming to experimental design. Nevertheless, Geha emphasized the course’s accessibility to all interested students: “You aren’t expected to know anything coming in, but we really hit the ground running.” Despite the rigorous pace of the class material, students responded positively on their overall class experience. Former student Kareem El-Badry describes the trip as “the highlight of [his] semester,” as he recalls climbing across catwalks hanging high over the telescope. Cover Image: The Arecibo Observatory in Arecibo, Puerto Rico, is the largest single-aperture telescope in the world. Image courtesy of the Yale Astronomy Department. A group of students in ASTR 255 at the rim of the observatory’s collecting dish. Image courtesy of the Yale Astronomy Department.